A little bit of late night name that tune, or rather, name that artist. Do you know who sang that song? Bonus points if you can guess what 80's show theme song he also sang? Googling doesn't count! Anyway, where was I? Oh, yes...the rain. If you are looking for whining or crying or moping, you won't find it here because we NEED the rain. The farmers need the rain! Husband tells me that we are still ten inches behind where we should be for the year. So we are bucking up and cozying up with some bright, cheerful spring time (indoor) crafts. Spring makes us think of babies and we have babies to celebrate. Aren't back to back baby showers a great way to welcome spring? These Quilties are for two wee ones due in the next few months. 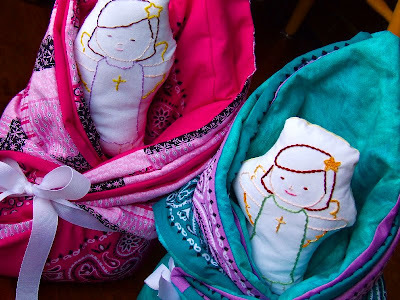 Shortcake embroidered the angel dolly on the left for her new godsister due to arrive on Holy Thursday! She was so excited to get to make something special for Baby O and really took to embroidering! I drew the design according to her specifications. It is loosely based on this one but with some alterations. I made the one on the right for a friend of my SIL who is a first time mommy at the age of 40! And a hearty congratulations to another friend in her early forties who just told us she is expecting! A quick prayer for her teeny tiny one would be lovely! These women are beautiful examples of God's blessings and generosity even at what most people nowadays think of as "advanced maternal age". I really don't like that phrase. Let's see if we can come up with something that reflects their beauty! Aw! Those turned out adorable!! I'll be saying a prayer for all the little one's and their momma's. Burt Bacharach. I know, I'm sick. It was the theme for Butch Cassidy and the Sundance Kid. We sang that song when I was in grade school (third grade, I think) for our special Father's Day -- a concert we would have each year for our priests in the parish (not our own fathers, but the Fathers -- you know). I don't think any schools do stuff like that any more. At least not for the clergy. I can still sing the entire song. Those are so cute! I wish I had some talent to do something creative. I know that Burt Bacarach wrote it...I think he sang it too and I have NO idea about the theme song question. You gals are right! I just checked, but the version I was thinking of was by B.J. Thomas who then went on to sing the Growing Pains theme song. That's the voice I hear in my head when this song pops on. Now, I have never seen Butch Cassidy & the Sundance Kid but that sounds like a strange theme song for such a rough and tough sounding movie. Weren't they bank robbers or something? Maybe Netflix carries it. Thanks for playing along! Those are so cute - what a great idea! Would you prefer I Love a Rainy Night? The song was played in that Western Movie and yes, it was very strange. They were riding bicycles if I can remember while the song played. Take Care. So, so cute! Handmade gifts are such treasures! And your daughter did a GREAT job on the dolly!! Burt Bachrach sang Raindrops, my sister in law met in once, I thought that was neat. I remember watching his show with Diana Ross I think it was and he played the piano and she would sing. Anyway, don't know the theme song for the show you spoke of. I enjoy your blog, I nodded lots during the Facebook thing, I don't do that either, just started blogging. I like it. I love the little dolls they are very pretty and will pray for the new mommies. Yes it was a bizarre moment in the movie. Actually pretty much ruined the movie for me. Like Megan said, they were riding bicycles in the rain. Very odd. Those are the cutest dolls! The dolls are very cute! The song did come from Butch Cassidy - my grandma loved that song and even bought a music box that played it! I don't know who sang it though.